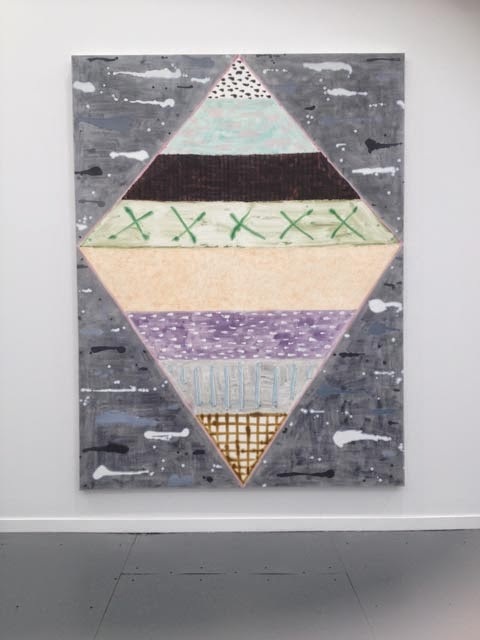 This year geometry and abstraction dominated Frieze New York, and, as usual, I was drawn to the paintings that didn’t seem as slickly produced. I veer toward the handmade rather than fabricated, the gestural rather than the hard edge. 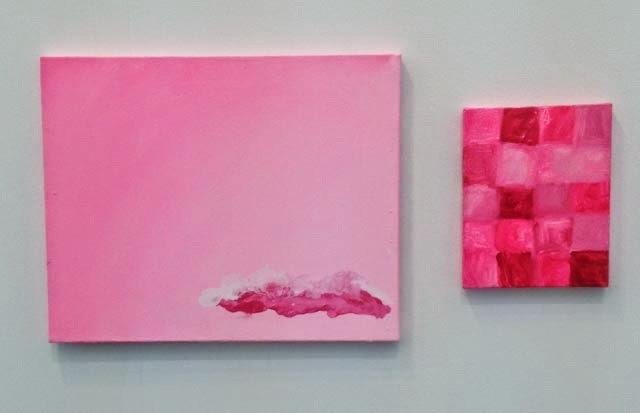 A good example is 303 Gallery’s selection, which included the two small-scale hot pink–and very cool–paintings by Mary Heilmann pictured above. Ancients & Modern (London) presented a jam-packed installation of ardent small paintings and ceramic sculptures by Norbert Prangenberg. Prangenberg, who died in 2012 at 63, said he never felt compelled to develop a signature style, yet his experimental undertakings do manifest considerable cohesion, as well as tireless imagination and gusto. 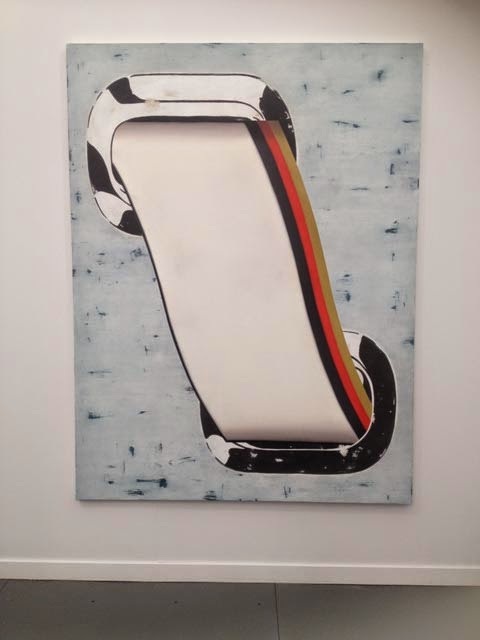 At Dépendance (Brussels) Sergej Jensen’s paintings rewarded close looking, or a fast look, depending on your point of view. His hand-painted grid in red on an orange ground continues his exploration of textiles, weaving, and a less painterly approach to painting. 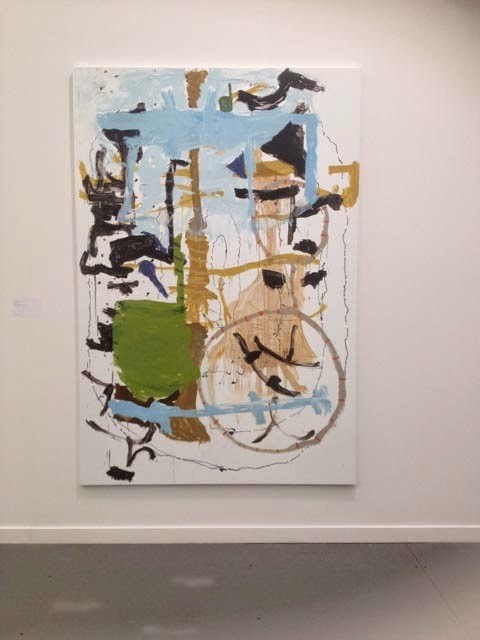 Richard Aldrich was also included in the display at Dépendance, with the large canvas below, but without the peripheral objects that accompanied his installation at Bortolami last fall. 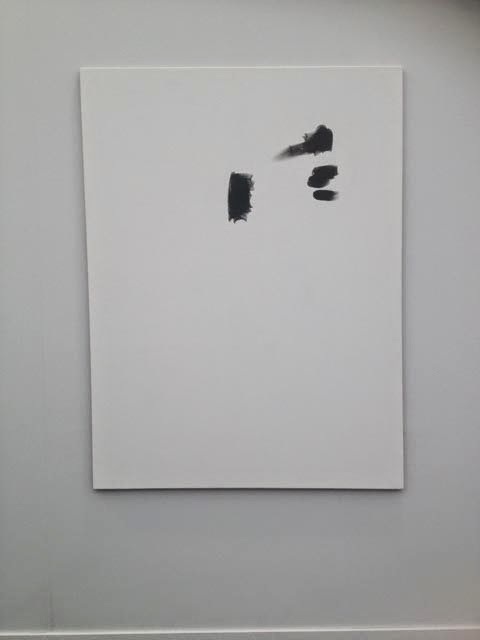 Maureen Paley (London) presented MP-KREBM-00069, a challenging 2013 Michael Krebber painting whose inventory number serves as the title. Last year this one was included in his solo at the gallery. 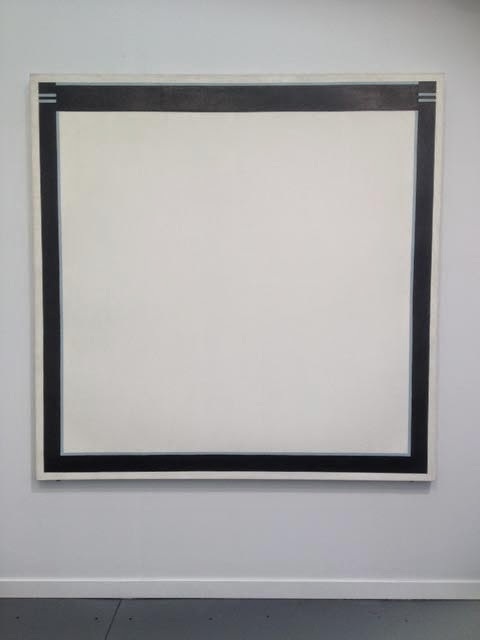 Massimo Minini exhibited one of Jo Baer’s Minimalist paintings from the 1960s. Baer, who turned away from abstraction in the 1980s to explore figurative painting, will have recent work included in the 31st Bienal de São Paulo, Brazil, in September. 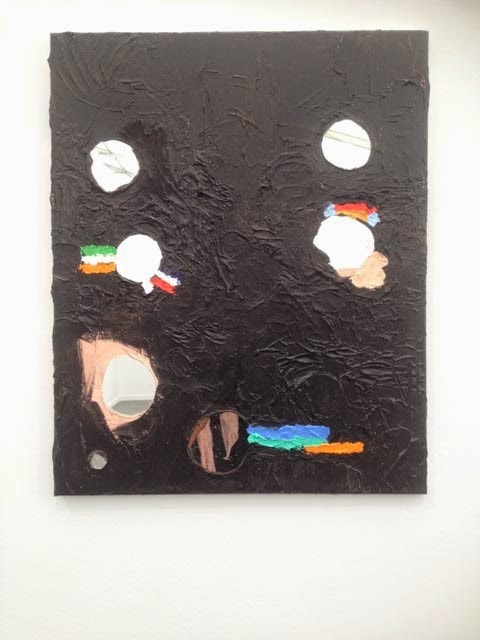 Galerie Barbara Weiss (Berlin) showed this small-scale Monika Baer painting that featured thick, saturated color and inset mirror fragments. “I employ very common symbols that vulgarize the notion of the high-artness of painting,” Baer wrote in a 2013 “500 Words” ArtForum post. 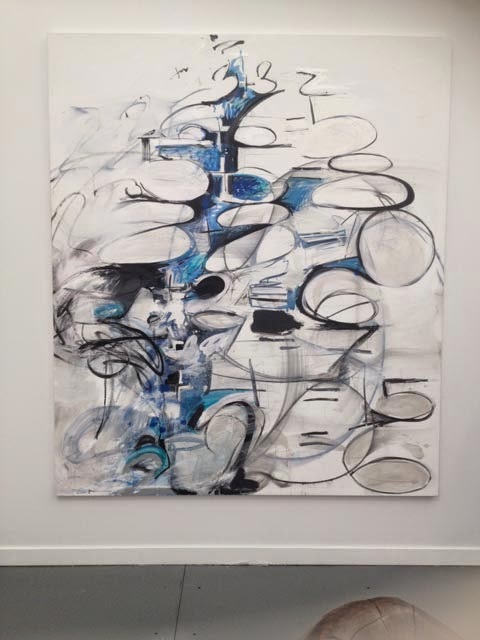 This year she had her first US museum exhibition at the Art Institute of Chicago and Williams College Museum of Art. 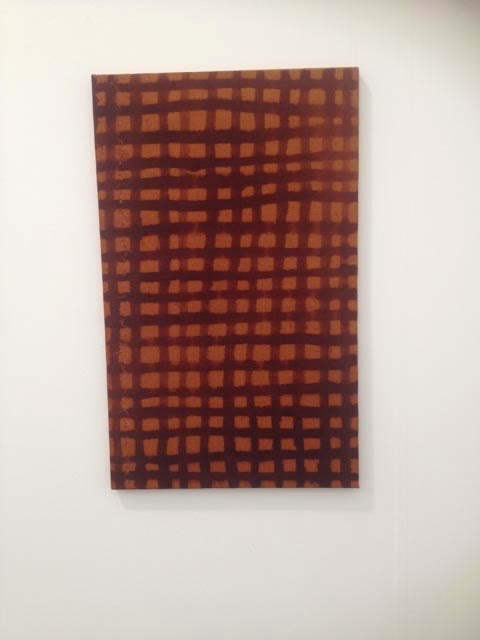 Rebecca Morris was also in the Barbara Weiss booth, both in paint (above) and in person. Meeting artists whose work I have admired (and blogged about) over the years is always gratifying. 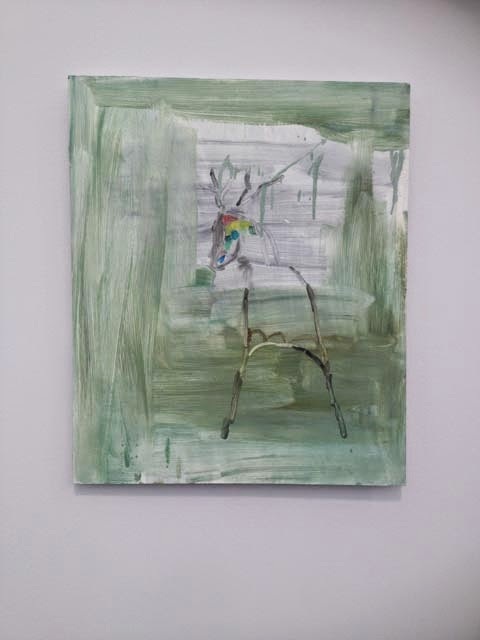 Anne Neukamp‘s Latz at Galeria Gregor Podnar (Berlin). Neukamp’s clever paintings amplify the hardware found throughout contemporary interiors but often overlooked. 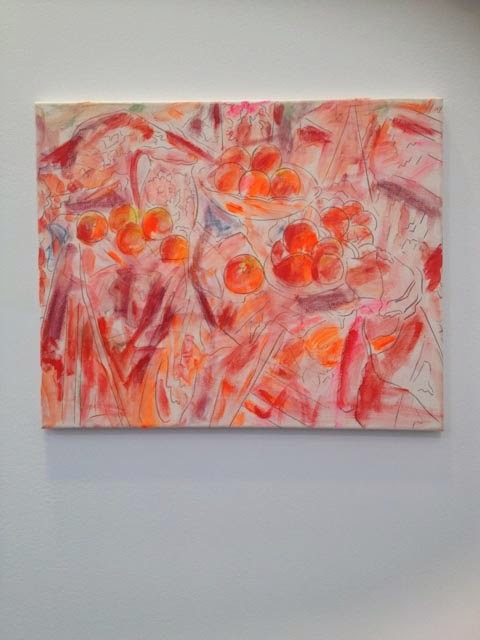 Suzanne McClelland‘s energetic paintings were included in a couple of booths. This one, Solutions Double from 2013, was at Shane Campbell (Chicago). She has a solo show scheduled at the gallery’s Lincoln Park location in November. Bortolami brought some small-scale Jutta Koethers. I love the agitated brushwork combined with the outline drawing. This one is from 2014. 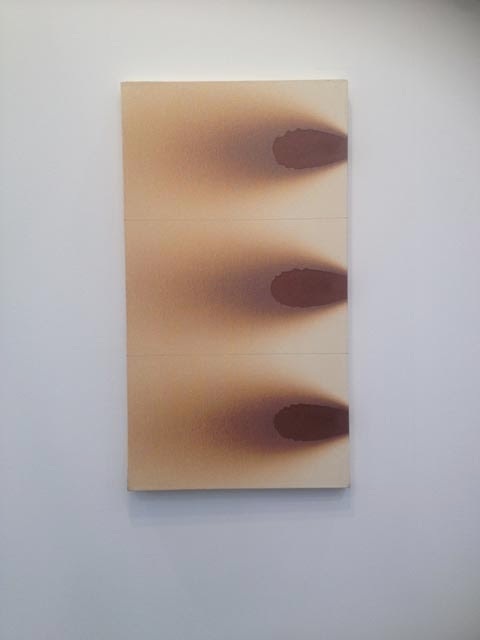 A Michael Venezia spray painting from 1972 at Galerie Greta Meert. Venezia’s ongoing series of narrow-bar paintings that I first saw in the 1990s should be included in the conversation about the slippage between painting and sculpture. 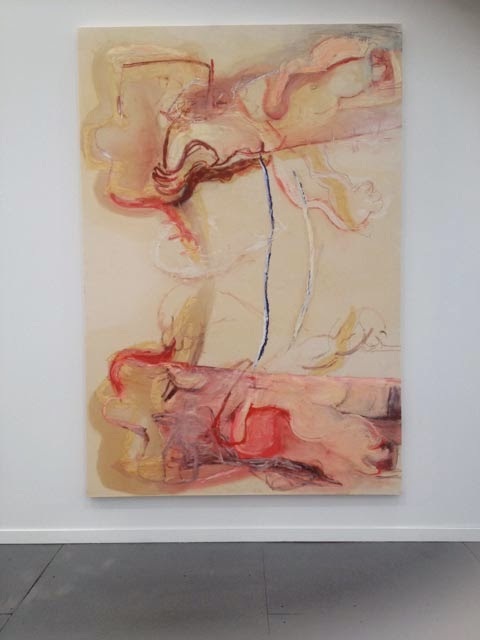 Negative Muscle Twin, a big, and in fact muscular, 2013 Rita Ackermann on the outside wall at Hauser & Wirth made me stop and take a closer look. 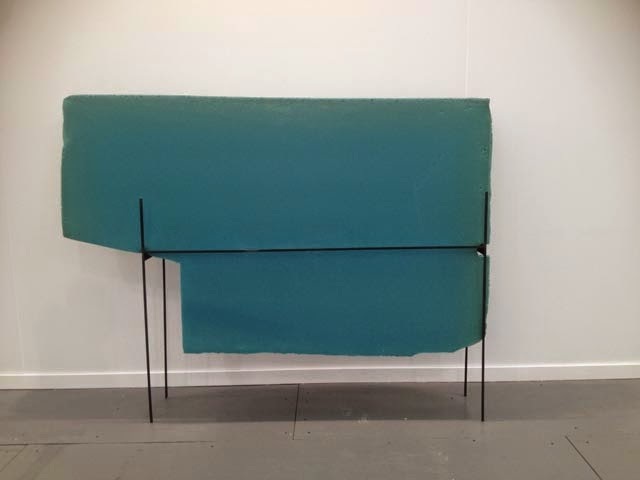 Spruth Magers (Berlin, London) brought this irresistible Thea Djordjadze sculpture comprising a hunk of blue foam and a metal frame. I discovered Djordjadze’s work a few years ago when I was composing profiles for Artsy. “Her objects, sculptures, and installations offer a poetic interpretation of the form and function found in our everyday lives,” I wrote. 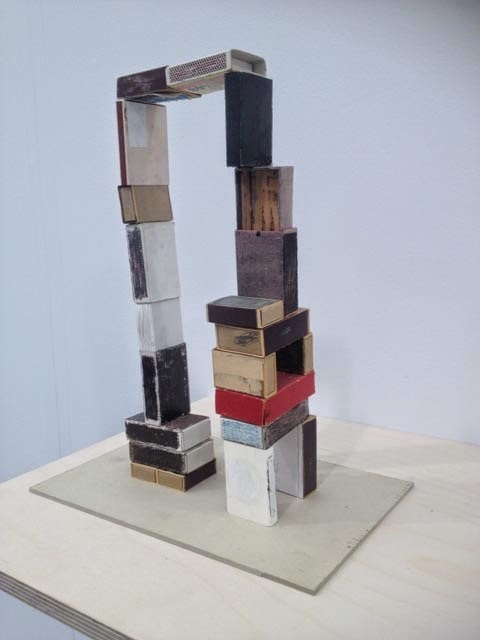 A frail sculpture made of painted matchboxes by Jockum Nordström was a standout at Galleri Magnus Karlsson (Stockholm). 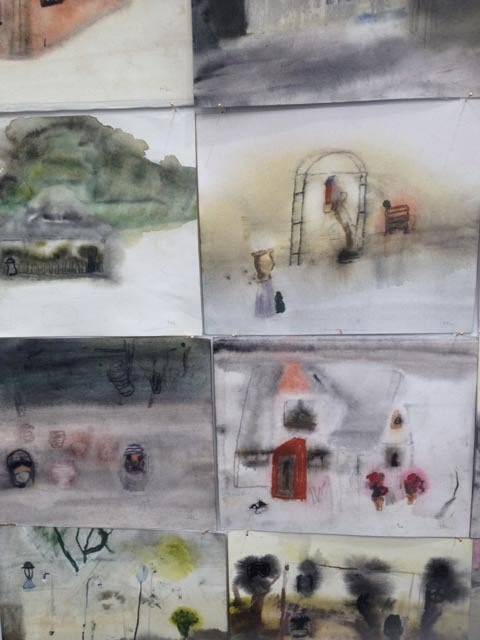 Strangely poignant: A wall of watery watercolors by Hans Lannér, also at Galleri Magnus Karlsson (Stockholm). 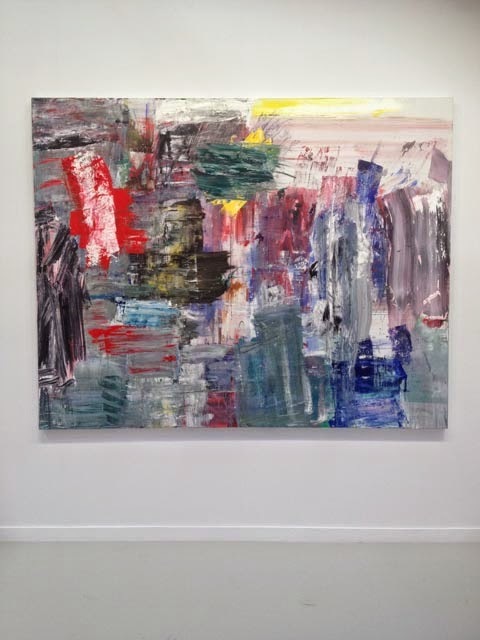 And finally: For GGG, a brand new Louise Fishman at Cheim & Read. 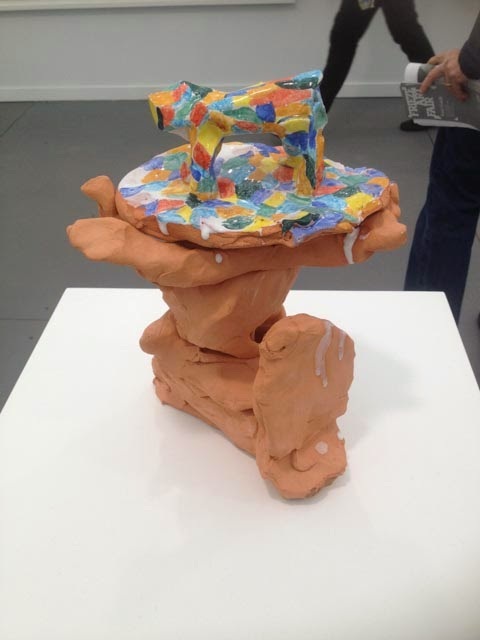 Fishman seems to be embracing a wider range of color in her new work. I bet it was still wet!